A simple square frame painted in a glossy black adds a focal point, and ties in the black Eames chair in this otherwise all white and airy space. Such a simple, clever idea (and a very easy DIY idea!). While personally I'm always drawn to simple black and white, this idea could work well in any colour. Smart and Chic. Great idea. What a great idea...really pops with that little bit of color. Love how simple it is...looks calm ! Yeah, I like it! Very simple and very striking. It makes me go "hmmm..."
Sometimes it's something just this simple that can really make a space sing. I'm always envious of minimalistic spaces. 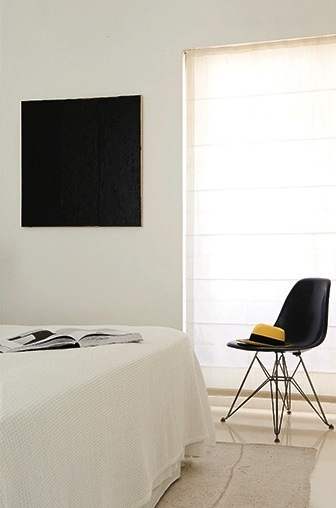 That simple black art is really all this room needs. Unfortunately I'm a maximalist at heart. I'd probably go in there and add a big painting and some pretty textile or throw. But it sure is fun to view other these clean spaces. I love this simple, stylish and affordable idea for the black artwork. Visit Sharalee M's profile on Pinterest.